The UK may be forced to change its "economic model" if it is locked out of the single market after Brexit, Chancellor Philip Hammond has said. Mr Hammond said the government would not "lie down" and would "do whatever we have to do" to remain competitive. He had been asked by a German newspaper if the UK could become a "tax haven" by further lowering corporation tax. 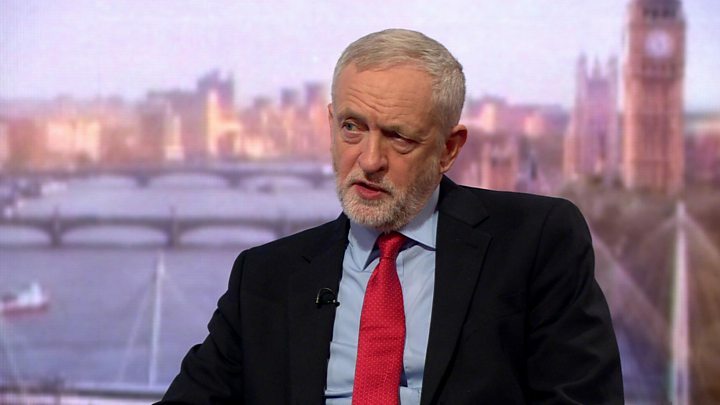 Labour's Jeremy Corbyn said his comments sounded like "a recipe for some kind of trade war with Europe". Single market or customs union deal? What are the Brexit models? Having so far refused to offer a "running commentary" on her plans, Prime Minister Theresa May is expected to spell out the most detail so far of her Brexit strategy in a speech on Tuesday. Reports have suggested she will signal pulling out of the EU single market and customs union, although Downing Street described this as "speculation". 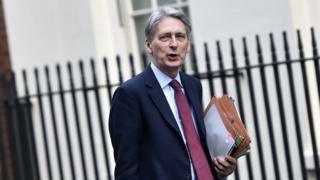 In an interview with the German newspaper Welt am Sonntag newspaper, Mr Hammond said he was "optimistic" a reciprocal deal on market access could be struck, and that he hoped the UK would "remain in the mainstream of European economic and social thinking". "But if we are forced to be something different, then we will have to become something different," he said. "It seems to me a recipe for some kind of trade war with Europe in the future. That really isn't a very sensible way forward." Mr Corbyn also said Mrs May "appears to be heading us in the direction of a sort of bargain basement economy", adding: "It seems to me an extremely risky strategy." According to Philip Hammond, Britain might be "forced" to change its economic model. To what? For some, the true advantage of leaving the EU would be to tear up the 'rules' and make Britain more like Singapore. Singapore abides by World Trade Organisation and ASEAN (the Association of Southeast Asian Nations) trade rules, but it's famed for its light touch regulation - especially when it comes to financial services - which some Brexiteers feel is the opposite of EU "meddling". But turning a large G7 economy with a robust social model into a city state might be difficult. It might involve the government handpicking which industries it thinks will be successes and rapidly neglecting existing sectors. Millions of people would need to get brand new qualifications while those with undesirable skills would become surplus to requirements. Massive infrastructure projects might be rushed through with minimal consultation. For a country with Britain's past and present, is that a possible future? Scottish First Minister Nicola Sturgeon said it appeared Brexit would mean a "low-tax, deregulated race to the bottom", with workers' rights and environmental protections threatened. She wrote on Twitter: "If that is the case, it raises a more fundamental question - not just are we in/out EU, but what kind of country do we want to be?" In her speech on Tuesday, the prime minister is expected to call on the country to "put an end to the division" created by the EU referendum result. She will urge the UK to leave behind words such as "Leaver and Remainer and all the accompanying insults and unite to make a success of Brexit and build a truly global Britain". Several of Sunday's newspapers claim Mrs May will outline a "hard Brexit" approach, a term used to imply prioritising migration controls over single market access. Northern Ireland Secretary James Brokenshire said he did not think it was a "binary choice" between trade and migration, but added that the "very stark message" from the EU referendum was that "free movement as it exists today cannot continue in to the future". Speaking on the BBC's Sunday Politics, Liberal Democrat leader Tim Farron said a "hard Brexit" had not been on the ballot paper in June's referendum and accused the PM of adopting "the Nigel Farage vision" of Brexit. Mr Farage, the former UKIP leader, told Sky News he had "yet to be convinced" by the PM's approach.